Bayern last year. Maybe don't dig a hole this time? DEATHRUN1 comes to an end tonight with the biggest of them all, as the defending European champion Bayern Munich comes to the Emirates for the first leg of their Round of 16 Champions League tie. You really can't come in on better form than Bayern, who have drawn twice and lost twice this season, across all of their fixtures. You'll see more details in the "Current Form" section below, but to say they've been a powerhouse is an understatement. Last season's best team in Europe somehow got better. But, it should be noted that the last team to keep Bayern from scoring was Arsenal in the second leg of last year's Round of 16 tie; it wasn't enough to salvage the tie but it was enough to give the Gunners belief in their fight for fourth place, which was ultimately successful. The circumstances are much better for Arsenal this year, recent struggles included. They're challenging for first instead of fourth place in the Premier League. They won their fifth round FA Cup tie over Liverpool to head into this match, instead of losing their fifth round FA Cup tie to second division Blackburn, as they did last year. Pundits have (correctly) pointed out that Arsenal have not won enough of the big challenge games this year. Yes, they won in Dortmund and yes, they've beaten Liverpool twice at the Emirates. But, they took only one point of six from a struggling United, failed to beat Chelsea in two tries at home (one in the League Cup, of course,) and have lost a few lopsided road games as well, 6-3 at the Etihad and 5-1 at Anfield. Arsenal likely won't win silverware without a big victory somewhere down the line. Why not get the ball rolling now? Why not this one? They have some big work to do. No injury updates for Arsenal since the FA Cup tie at the weekend; Arsene Wenger mentioned specifically that Tomas Rosicky is available, while Thomas Vermaelen has not yet returned to training. It's as you were with everyone else. Unfortunately, there's bad news in that Mikel Arteta is banned for one match after his Matchday 6 red card at Napoli, though since that was well known in advance, Wenger opted to use Arteta on Sunday in a scenario where he likely would have only played one of the two matches anyway. This almost certainly means Jack Wilshere comes back into the side in the center of midfield, though I personally hope his playing alongside Mathieu Flamini means the youngster won't drift too far forward like he did at Anfield. Arsenal need the Frenchman to keep the back group in line, with regards to their positioning. Up top, I would expect a return to the starting XI for Olivier Giroud and Santi Cazorla. I wouldn't be surprised if Big Game Rosicky started as well. Predicted XI: Szczesny, Sagna, Mertesacker, Koscielny, Gibbs, Flamini, Wilshere, Cazorla, Rosicky, Ozil, Giroud. While there might be some consolation in the fact that Franck Ribery and Xherdan Shaqiri have both been ruled out through injury for this match, it should be noted that Shaqiri was replaced by Bastian Schweinsteiger, himself returning from an ankle injury that kept him out for three months. I would expect that he'll slip straight into the midfield. Ribery's injury is expected to keep him out until March. In better injury news for Bayern, Holger Badstuber has returned to training; the 24-year-old has missed 14 months after needing four knee operations. Bayern Munich are so deep that even without Ribery and Shaqiri and with my predicted squad including Schweinsteiger, Toni Kroos, Arjen Robben, Thomas Muller, and Mario Mandzukic, I'm still leaving out Thiago Alcantara and Mario Gotze. That's a bit terrifying. Predicted XI: Neuer, Rafinha, Boateng, Dante, Alaba, Lahm, Muller, Robben, Kroos, Schweinsteiger, Mandzukic. I've noticed Yaya Sanogo loves celebrating goals. Arsenal come to the end of DEATHRUN1 with a strange record: they were on the wrong end of a tonking in the first match, played out a frustrating 0-0 draw in the second, then won the third despite many clamoring that they weren't the better team. Arsenal desperately needed their luck to change a bit at some point and Sunday's FA Cup tie might have been just that. Still, they will not likely face another opponent in as formidable form as Bayern Munich. The visitors in tonight's match have lost just two games this season and the first of those was the German equivalent of the Community Shield, so it barely even counts. The other loss came to Manchester City in December, though it was on Matchday 6 with nothing to play for and they jumped out to a 2-0 lead, switched off a bit, and capitulated. Bayern have played 21 matches in the Bundesliga, yet, are already 16 points clear of Bayer Leverkusen in second. Bayern have won 19 and drawn two. They have not lost a league match since October 28, 2012. Last week, they coasted into the semi-final of the DFB-Pokal, Germany's domestic cup competition, with a 5-0 win in Hamburg; they'll face second tier Kaiserslautern in the semi in mid-April, while Dortmund faces Wolfsburg. Bayern have scored in each of their last 50 matches, across all competitions (I think this includes their win in the FIFA Club World Cup as well.) 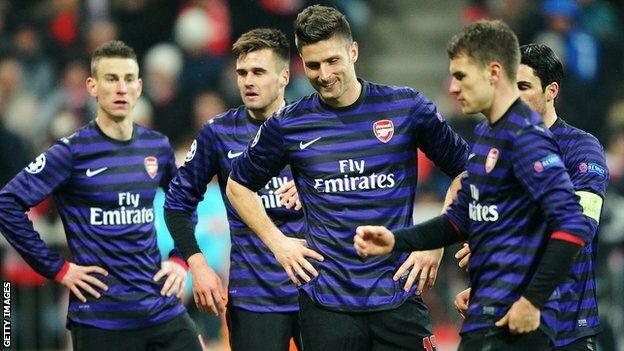 The last team to keep them off the scoresheet was Arsenal. year. This is the most dejected 2-0 victory photo you'll find. You might recall that Arsenal and Bayern met in this round of the Champions League last year, with Bayern advancing 3-3 on away goals. Of course, the tie overall never quite felt that close, as the Germans jumped out to an early lead at the Emirates in the first leg; Toni Kroos scored seven minutes in and Thomas Muller doubled Bayern's advantage in the 21st minute. Lukas Podolski pulled a goal back for Arsenal in the 55th, but Mario Mandzukic re-established Bayern's two goal advantage in the 77th, completing a 3-1 win for the visitors. That scoreline meant Arsenal had to win by three clear goals in the second leg in Munich; despite being the only visiting team to keep a clean sheet at the Allianz Arena all year, goals from Olivier Giroud and Laurent Koscielny were not enough, as Arsenal bowed out on away goals. Arsenal's only other victory over Bayern came in the second leg of the 2005 Round of 16, though that 1-0 win at the Emirates was not enough to overturn a 3-1 deficit from the first leg. In the 2000/01 second group stage, Arsenal lost 1-0 in Munich and drew 2-2 in London. The Gunners are in the Round of 16 for the 14th consecutive year, however, they have not advanced past this stage since 2010, bowing out in this round to Barcelona, AC Milan, and Bayern Munich in the last three seasons, respectively. Arsenal have lost three consecutive home games against German opposition (Schalke and Bayern last year and Dortmund this year;) they have an all-time record of nine wins, four losses, and one draw against German sides in London. Bayern have only won four times against English sides on English soil in 17 matches; they have lost six and drawn seven. They did win twice in 2013, winning at Arsenal and at Manchester City. They did lose to both sides, however, at home, which is astonishing when you look at Bayern's overall form and how rarely they lose at all. The crew of officials is from Italy; the referee is Nicola Rizzoli. Arsenal have seen Rizzoli twice, first for their famous 2-1 win over Pep Guardiola's Barcelona in 2011 and again last year, on German soil, when Schalke came from 2-0 down to draw 2-2 in the group stage. Bayern, on the other hand, have a record of one win and two losses with Rizzoli, but their "record" is not as cut and dry as that, so let me explain. The one win was a pretty big one, as it was last year's final at Wembley, over Borussia Dortmund 2-1. In addition, their first loss with Rizzoli was really a win, as their 3-2 loss at Old Trafford saw Bayern through on away goals, after Rafael was controversially sent off. Their other loss completes the gamut of results, as it was a 1-0 loss at Basel in the first leg of the 2012 Round of 16; Bayern won the second leg 7-0.